Have you ever handed your toddler your camera and send them on their merry way? Last week I gave Broden my Virgin Mobile Samsung Galaxy S II cell phone with the camera open and ready to shoot. I sat back and worked on preparing dinner while my little guy ran wildly through the house snapping pictures of the things he found interesting or loved. Not only was he having the time of his life, it bought me roughly 45 minutes of quiet time as he photographed nearly every toy we own and almost all the random products we have including two shots of the inside of our garbage can. After scrolling through over 200 pictures I narrowed it down to some of the clearest ones and made a collage for you, my readers. Through all the pictures I noticed he seems to keep is finger pointed and slightly covering the lens, blocking the image. At some point near the beginning he must have touched the lens as the majority of the pictures appear to be smudged. To keep the integrity and honesty of the post and my three year old son’s photography session I left the edit button alone. I arranged them in a collage, but did not tamper with them at all, after all, this is about Broden, and his love of photography and playing with electronics. The first picture I was surprised he was able to navigate the phone to the “selfie” setting and take a picture of himself and then switch the mode back to the reverse side of the camera. Hand your camera or cell phone to your child or grandchild and send them through the house to freely and independently capture images that are important and interesting to them. You might be surprised by what you find! Once they are done, upload them to your computer and create your own collage. I used Ribbet Collage Maker, a free collage maker photo site to create my collage being it shrinks the full image rather than cropping. 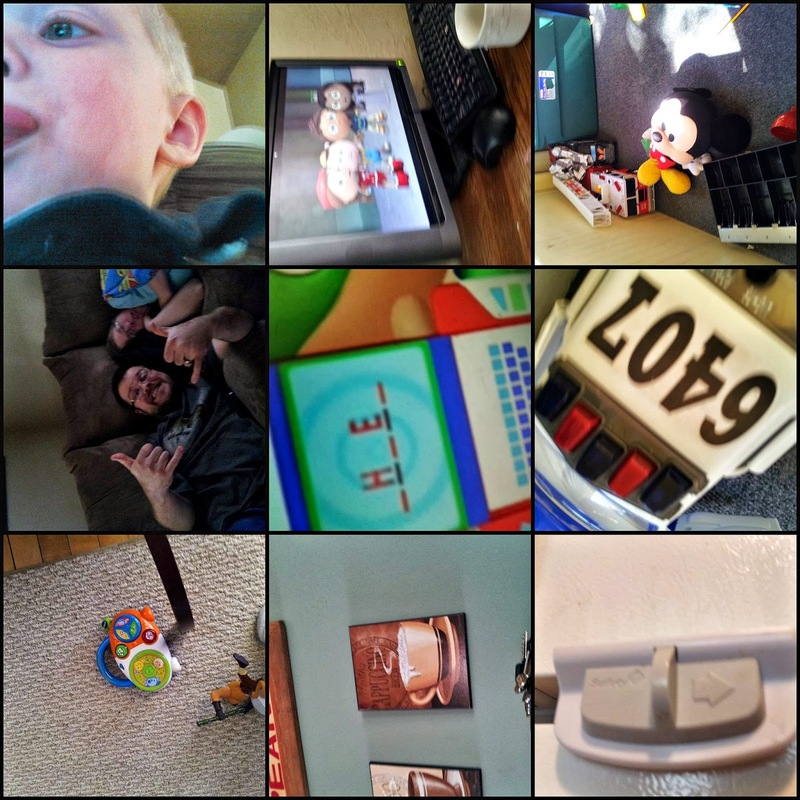 Once your collage and post are complete, come back and link up your “In Your Child’s Eyes” blog post showing the variety of pictures your little one has taken! That is such a fun idea! It really gives parents a fun perspective on what they find interesting. Thanks so much for sharing! 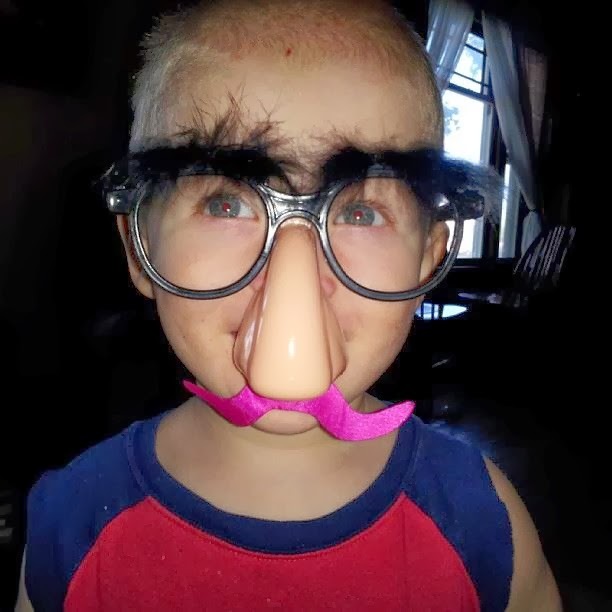 love the disguise – too cute! This is so cute! I have to try this! What an interesting thing to do … view the world through the eyes of a child. So sweet. My kids always steal my iPhone and go around the house snapping photos. I need to save them next time and make a collage, great idea. Aw cute, I love the fun photos your kiddo captured!!! We don’t have any kids or I would so do this!! I have always handed my kids cameras, even my16 year old when things were not digital. I also take one day a month to turn off all devices and let them lead me through the park. It is amazing to see the world through their eyes, it is usually a better place. Glad the Samsung held up to the abuse I am sure it went through! I let my little ones explore with my camera all the time and they love it! The smallest one can operate it better than me sometimes. I had some of the pictures printed on a blanket not to long ago, I agree it is amazing seeing their view of the world through their eyes.